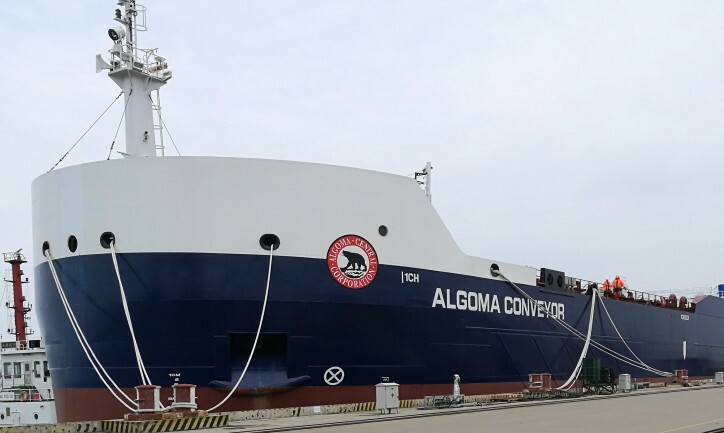 Algoma Central Corporation (Algoma) (TSX: ALC), a leading provider of marine transportation services, today announced that the recently completed Algoma Conveyer, the third Seawaymax Equinox Class 740’ self-unloading dry-bulk carrier, has begun its delivery voyage from China to Canada. The vessel began its two-month journey home, departing the Yangzijiang shipyard on February 16, 2019. After taking fuel in the Philippines the vessel will cross the Pacific Ocean, traveling through the Panama Canal and from there will make its way to Canada. The vessel is expected to arrive in early April. “We are looking forward to the Algoma Conveyer joining our fleet for the 2019 navigation season as market demand and volumes are strong,” said Gregg Ruhl, President and CEO of Algoma. “Our Canadian crews and our customers are excitedly awaiting the arrival of our new ship,” added Mr. Ruhl. The Algoma Conveyer will be the eighth Equinox Class vessel to join Algoma’s Domestic Dry-Bulk fleet since the first vessel, the Algoma Equinox, arrived in 2013. The Algoma Conveyer was the first and only Equinox self-unloader partially built for Algoma by the now bankrupt Nangtong Mingde shipyard. Algoma acquired the hull at auction in September, 2017 and it was then taken to the Jangzijiang shipyard for final construction. The Equinox Class fleet now includes four gearless bulkers and four self-unloaders. Replacement of ageing ships with modern, fuel- efficient and environmental friendly vessels enables Algoma to better serve the evolving needs of its customers.